The gamin (street urchin), all alone in that “teeming desert called Paris”, as depicted on the opening curtain of this production, is presumably la petite Plessis. Courtesan Marie Duplessis was the inspiration for the character Marguerite Gautier, in La dame aux camélias, by Alexander Dumas (fils). As Professor René Weis records, Duplessis eventually married Edouard, Vicomte de Perregaux, the precursor of the character Alfredo Germont. We were reminded of Michael White’s description of Arianna Stassinopoulous, to wit, “the most upwardly mobile Greek since Icarus”. 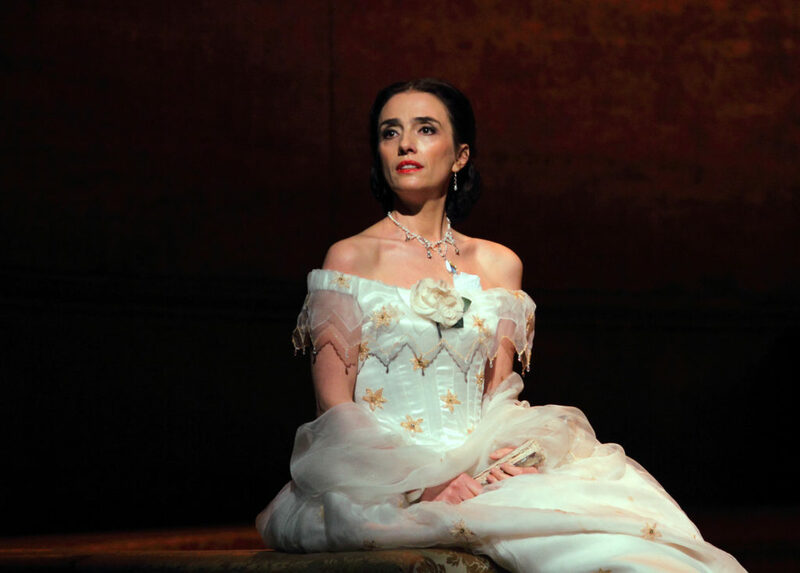 In this, the 16th revival, no less, of Richard Eyre’s production, first seen in 1994, Violetta is played by Albanian born soprano Ermonela Jaho. A svelte and striking figure, Ms Jaho has a commanding stage presence and looks perfect in the part. She confidently follows in the footsteps of previous distinguished performers of this demanding role. Her rendition of the poignant aria Dite alla giovine received warm applause. Jaho and soprano Charles Castronovo, as Alfredo Germont, make a handsome couple. 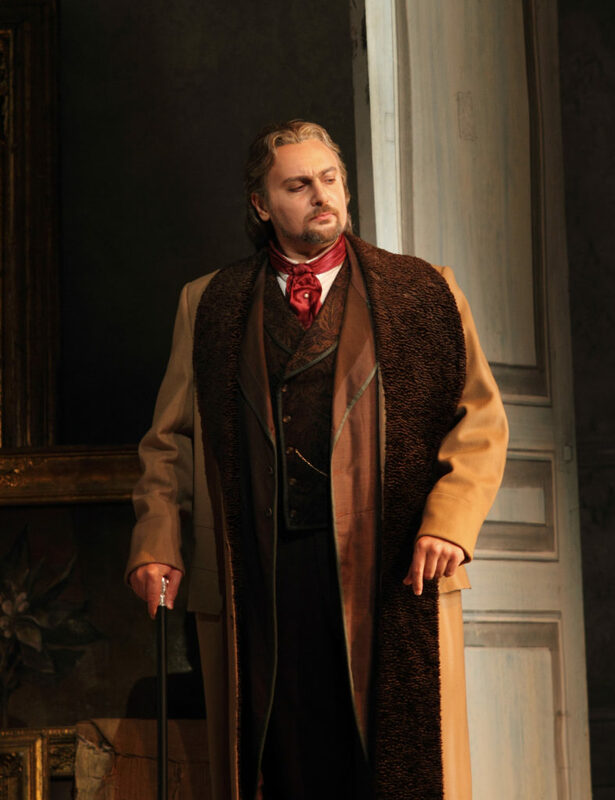 But baritone Igor Golovatenko (Giorgio Germont) in his Royal Opera debut, was underwhelming, especially in the aria Di Provenza, usually a highlight of La Traviata. Not only Violetta but also Alfredo and his father are sporadically in denial about her imminent death. For as Warwick Thompson remarks, “Violetta’s ‘pleasure’ is…a mask with which she screens her mortality from herself’” (‘Why is Champagne not Mentioned?’, Official Programme). Alfredo, likewise, is persuaded that Violetta’s illness is attributable to her “life style” and could therefore be reversed. Christopher Wintle has identified the different phases in the inexorable progress of TB which can feed such illusions, notably “the co-existence of lassitude and hoarseness with bursts of excitement and ‘foolish gaiety’”, as in scene i, and the “moment of spes phthisica”, when the dying patient thinks that he or she is cured, as in Act III, final scene (‘A Tragedy of Affliction?’, Official Programme). But on the opening night, there was more coughing in the audience than on the stage, blood stained bedding notwithstanding. Every performance of this compelling work yields fresh insight. This entry was posted in Cultural Matters, QR Home and tagged Christopher Wintle, Ermonela Jaho, La Traviata, Marie Duplessis, Richard Eyre, Royal Opera, Verdi. Bookmark the permalink.